It seems like Tilapia fish is a very popular choice of fish everywhere these days, and no difference here in Vancouver. They can be purchased either live and still swimming in the tank or quick frozen. 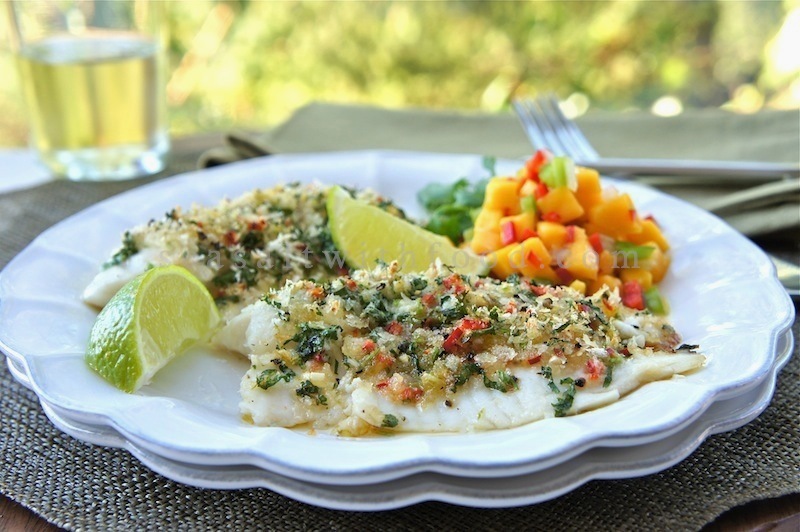 This fish has a mild flavor; but, is full of protein, low calorie, and low saturated fat. Anyway, I baked this Coriander and Lime-Crusted Tilapia Fish using a packet of quick frozen Tilapia fillets in less than 8 minutes. 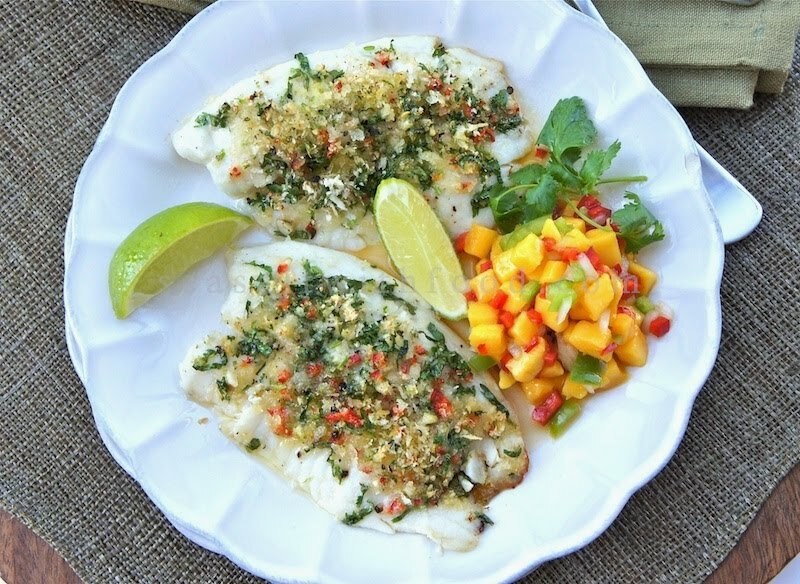 My family and I thoroughly enjoyed the Tilapia, which I served with some fresh mango salsa. If you need the recipe for the mango salsa, you can get it here. Just remember to dice all the ingredients into smaller than the usual bite sized pieces to complement this delicate fish. Enjoy! In a small bowl, combine the breadcrumbs, fresh coriander, lime zest, garlic, and red chili. Grease a large baking tray with 1 Tbsp of olive or peanut oil. Toss the remainder oil to the fish, and season with salt and pepper. 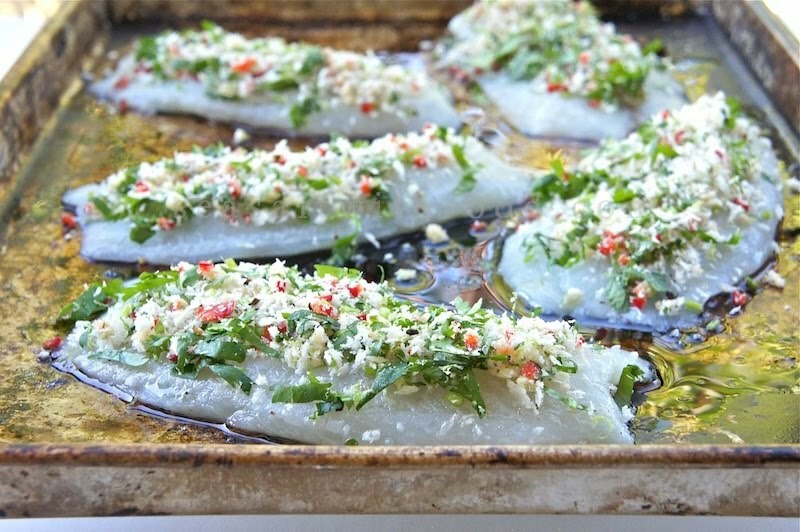 Place the fish fillets on the baking tray and top with coriander and lime breadcrumbs. Pour the melted butter all over the fish fillets. Bake the fish for about 6 to 8 minutes, until the fish fillets are fully cooked. Serve immediately with some lime wedges and mango salsa. Wow! I'm bookmarking this recipe. Thanks Angie. What a great healthy dinner and so pleasing to the eyes as well as the palate. Wow what a great colourful and fragrant dish . This looks incredible ad so simple to make. I love the addition fo panko breadcrumbs. Yummy!